Tom Waits (born Thomas Alan Waits, in Pomona, California, on December 7, 1949) is a prolific American singer, songwriter, composer, and actor. He started his career in the early 1970s as a singer in spit 'n' sawdust bars. Initially, he was deeply influenced by the beat generation, novelists like Jack Kerouac and William S. Burroughs, and poets like Allen Ginsberg and Charles Bukowski. Waits is often compared to Charles Bukowski, being similar both in content and lifestyle, although Waits's views are more egalitarian than Bukowski's. He started his career in the early 1970s as a singer in spit 'n' sawdust bars. Initially, he was deeply influenced by the beat generation, novelists like Jack Kerouac and William S. Burroughs, and poets like Allen Ginsberg and Charles Bukowski. Waits is often compared to Charles Bukowski, being similar both in content and lifestyle, although Waits's views are more egalitarian than Bukowski's. 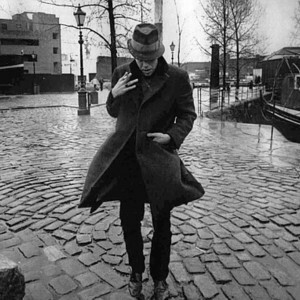 Waits was unable to make a living from his music in the 70s because his classical bar music, based in pre-rock, and americana, blues, and vaudeville styles were not popular. Waits's voice back then was soft, warm and clear. Waits subsequently developed a devoted cult following and has influenced subsequent songwriters, despite having little radio or music video support. In fact, his songs are perhaps best known to the general public in the form of cover versions of more visible artists, such as the Eagles, Bruce Springsteen and Rod Stewart. Although Waits's albums have met with mixed commercial success in his native United States, they have occasionally achieved gold album sales status in other countries. Lyrically, Waits's songs are known for atmospheric portrayals of seedy characters and places; he sings about the losers on the streets: alcoholics, junkies, prostitutes and social outcasts, although he also includes more conventional and touching ballads in his repertoire. While opening for Frank Zappa, the audience catcalled and refused to listen to him; he was an unsuitable match with Zappa's avantgarde style. Countless cigarettes, gallons of alcohol and many all night parties eventually left their trace in his face and voice. His more recent gravelly voice can be first heard on "Small Change". This distinctive voice turned out to be his trademark. It is described by the Music Hound Rock Album Guide as sounding "like it was soaked in a vat of bourbon, left hanging in the smokehouse for a few months and then taken outside and run over with a car". "Small Change" with its sentimental ballads, its bar-jazz attitude and Film Noir-oriented stories turned out to be his biggest commercial success in the 1970s. Waits subsequently developed a more unique style. His songs have grown more abrasive since then, and the arrangements have turned more surreal and experimental with every new record. His life brings him to new visions, as indicated by the direction taken in his "Alice" release. While composing the soundtrack for Francis Ford Coppola's "One From The Heart" Waits met Kathleen Brennan, his bride-to-be. They married in 1980 and she helped him quit drinking and smoking. Since their marriage they have been working together on his albums as co-producers and co-writers. It is hard to say which part belongs to her and which to him, but it's easy to see that they make a perfect team. Additionally, his eldest son Casey can be heard on turntables and percussion on Waits's album "Real Gone". One of Waits's greatest successes was the album "Swordfishtrombones", released in 1983. It struck with his critics and fans alike. He achieved a new level of song writing and left former conventions (and his earlier career) behind. All songs, whether ballads, jive or jazz are played in a completely different way. It seems that Waits had taken the musical archetypes of these styles and made them his own. All tracks are in the quintessential Waits style. They have a striking rawness and listenability and they set the stage for his success and his future career. The Bad As Me Songfacts reports that 36 years after the release of Waits' first album, Closing Time in 1973, Bad As Me became Waits's first ever top 10 album in the US when it debuted at #6 with 63,000 sales. In the late 1980s Waits discovered an outlet for his creativity in composing musicals. His first Musical was named "The Black Rider", and is based on "Der Freisch?tz" by Carl Maria von Weber. It was co-produced by Robert Wilson and the lyrics come from William S. Burroughs. The story is slightly reminiscent of Kurt Weil's and Berthold Brecht's "Three Penny Opera" and the 1930s. The debut performance of the play was in 1990 at the Thalia Theater, Hamburg and has been played by various theatre groups since then. Waits was also responsible for two other musicals, which later became albums released simultaneously in 2002. One was the musical "Blood Money," which covers the "Woyczek" theme of Georg B?chner. This one is one of the darkest works from Waits. The other musical is based on Lewis Carroll's classic children's novel, "Alice's Adventures in Wonderland". "Alice" is very romantic, dreamy and soft, and contains one of Waits most romantic songs. Even though they were released at the same time, the bootlegs of the "Alice" musical were long before traded between fans and were just rearranged and re-mastered for the official release. Besides many film contributions as composer ? the Internet Movie Database imdb.com lists 47 appearances of Waits as composer and 38 soundtracks containing songs by Waits - he also is an actor with a total of 25 appearances, ranging from some mini-roles as a trumpeter in "Heart of Saturday Night" and the R. M. Renfield in "Bram Stoker's Dracula" to the major role of Zack in Jim Jarmusch's "Down by Law". He recently appeared in Roberto Benigni's "The Tiger and the Snow", playing You Can Never Hold Back Spring at Benigni's wedding dream. Even more recently, Waits played Mr.Nick (the Devil) in Terry Gilliam's "The Imaginarium of Dr. Parnussuss". In addition to a number of concert videos, he also appeared in the critically-acclaimed concert feature film "Big Time" (1990). Waits has always refused to allow the use of his songs in commercials. He has filed several lawsuits against advertisers for using his material without permission. Waits also successfully sued an advertiser for using a work that was stylistically similar to his work, after he had declined to sell them the rights to his song. He has been quoted as saying, "Apparently the highest compliment our culture grants artists nowadays is to be in an ad ? ideally naked and purring on the hood of a new car. I have adamantly and repeatedly refused this dubious honor."